okay, darnit! i’m posting those beautiful dishes from the dinner parties, whether i have nice pictures or NOT! 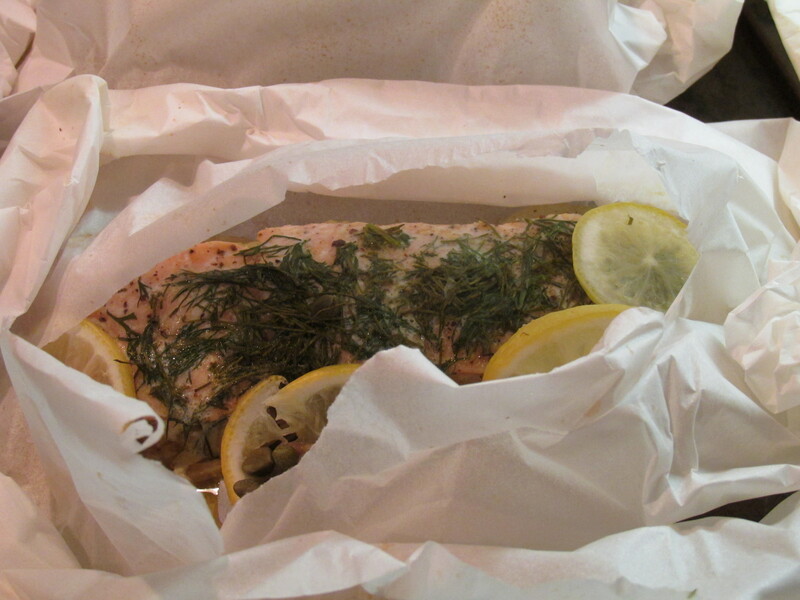 i’ll start with salmon en papillote: fancy-french for salmon baked in parchment paper. i’ve heard about it for years and years, but thought it might not be my cup of tea, since i really love a crunchy exterior on fish. which is why i love to fry it in a pan with coconut oil. but this is the most buttery, flaky, flavorful little pouch of goodness. it has won my heart as my new favorite way to have salmon. i’ve made this twice now, for separate dinner parties, and it’s a winner. you can prep it ahead and just pop it in the oven when your guests arrive. and you can change up the veggies that go in the packages, too, of course. i’d like to try it next time with thinly sliced potatoes. 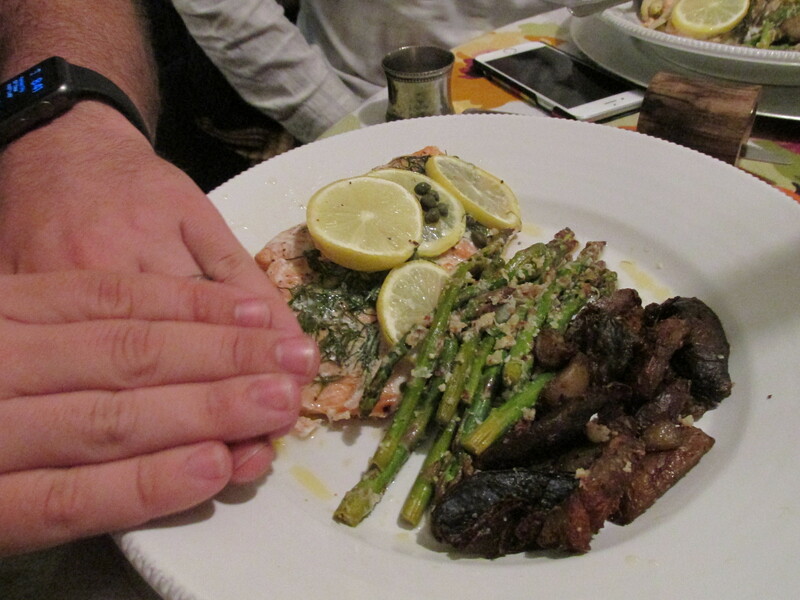 here are some pictures, which did not turn out very bright and cheery, but i just had to post this dish anyway. enough blurry, dark pictures ~ here’s the recipe! cut your parchment paper long enough to fit so that it folds over your salmon fillet, and then some. you want room for the veggies too. on the bottom third of the paper, lay down a bed of fennel slices, then the salmon. liberally sprinkle the salt, pepper and dill on top. next comes the butter. two pats on each salmon (or more if you have large fillets). top with slices of lemon. fold over the parchment paper and roll the sides up until they fit snuggly around the salmon. keep folding or rolling until the paper stays put. lay on a sheet tray and bake at 350 degrees for 25-30 minutes. Previous Previous post: blogger’s block confession. Next Next post: fruit with caramelized cream.